Symptoms of Xanax addiction include taking more Xanax than you planned, loss of control of Xanax use, and cravings for Xanax. How can you identify and address Xanax addiction? We explore here. Are you looking for help with Xanax addiction? 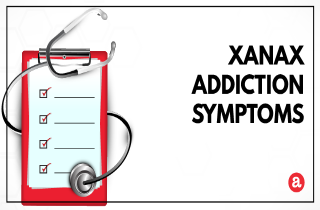 The signs and the symptoms of Xanax addiction are the side effect of chronic use of Xanax. How can you identify them and what is that you can do to address signs of Xanax addiction are the key points to the following article. Please save your questions about treatment for Xanax addiction and post them at the end. If you use Xanax over a longer period of time (a month or more of daily dosing), the body will develop dependence on Xanax. Withdrawal symptoms occur when doses of Xanax are lowered or interrupted after a period of dependence. That is the time when a doctor’s supervision are firmly recommended. Xanax addiction symptoms: Can they be treated? Xanax addiction can be treated. Under the right circumstances and with the proper addiction treatment, a Xanax addict can recovery. Help is available. What are some major ways that you can address Xanax addiction symptoms? Planning an intervention – An intervention is the first initiative taken by people who care about the addict and his well-being. Drug interventions can be formal or non-formal, and are facilitated meeting with a Xanax addict that aims to communicate an understanding the actual situation to the addict. In fact, an intervention aims to raise awareness about consequences of drug use and its impact on addict’s family, friends and colleagues. The desired outcome of an intervention is that an addict agrees to drug addiction treatment. Bear in mind that interventions may go wrong and unpredicted responses can occur. Therefore, a good way to reach a positive result is to call in a professional interventionist. Inpatient and outpatient addiction treatment – Inpatient or outpatient programs offer a variety of Xanax addiction treatments using different techniques and practices. The basic services offered by addiction treatment programs include detox, counseling, and support services. Inpatient treatment centers are typical rehab facilities with overnight accommodation. They offer around-the-clock care and a space away from the normal environment which can help the Xanax addict to focus on recovery. Inpatient Xanax treatment centers will deal with physical and psychological aspects of Xanax addiction in group and personal therapy sessions. Outpatient treatment centers, on the other hand, offer typical rehab services without overnight stay, but with treatment at the doctor’s office daily or weekly. Medications – Medications for Xanax addiction treatment can be used during acute Xanax detox or as a longer term tool to help manage anxiety. Alternative medications with lower dependency rate may be prescribed during the process of Xanax detox or over-the-counter medication can help support acute and protracted withdrawal symptoms. However, some body systems are more prine to substance addiction. It is therefore important to bavoid substituting one addiction for another. Psychotherapy and behavioral treatment – Psychotherapy and behavioral treatments for Xanax addiction address both the emotional and psychological sources of substance abuse. The use of clinical psychology for addiction includes combinations of cognitive behavioral therapy, contingency management, motivational enhancement therapy, and 12 step facilitation therapy. Psychotherapy helps you uncover and deal with the initial trauma which leads to Xanax use and turned it into abuse. We hope that you’ve found this article about signs and symptoms of Xanax addiction useful. But if there’s something more you would like to know, please feel free to post your question or share your comment in the section below. We will do our best to offer you a personal and prompt response. I took the .75 of xanax to get ready for bed I had the most adverse side effect ever and felt like I was going to die it finally subsided and I went to sleep the next morning I took my normal .5 xanax and the same thing happened and I went fully historical crying wanting to die and the most horrid feeling I’ve ever had , I’m addicted so I know it sounds stupid but 5 hours later I took it again and it did nothing good nor bad just nothing and I took the same .75 dose again at night time and the same thing happened I just feel like I’m in a fog of anxiety now and I’m living hell , I tried to make a appointment with my prescribing doctor and she’s out on maternity leave and the fill in doc will not see me until the 9th of November so I made a appointment with another doctor outside there practice not sure if I should have done than or tried to tuff this out any advice would be great thank you . I have diarrhea and trouble seeing when going through xanax withdrawal. Is this normal?? Hi, Dawn. Yes, diarrhea may be a symptom of Xanax withdrawal. Drink plenty of fluids to avoid dehydration. Also, you may seek advice from a pharmacist about your situation. Can you die from taking Xanax?